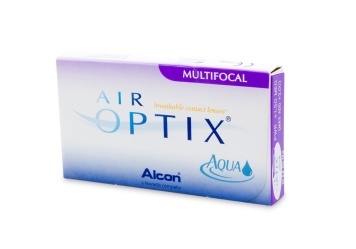 Air Optix Aqua Multifocals Help With Oxygen and Moisture There are some contact wearers that suffer from a lack of moisture in their eyes. There are also others that find their eyes become irritated when they don't get enough oxygen through the lenses. Many people actually fall into both categories, and find that they have difficulty locating a good contact lens that will assist with both of these issues. Just when many people were starting to think that they could not comfortably wear contact lenses, along comes Air Optix Aqua Multifocal lenses. Because of the way they are constructed, they allow as much as five times the level of oxygen to reach the eyes that you would get from traditional contact lenses. This incredible oxygen penetration comes from the silicone hydrogel material that is used to make the lenses. It may be one of the most significant developments since contact lenses were discovered.